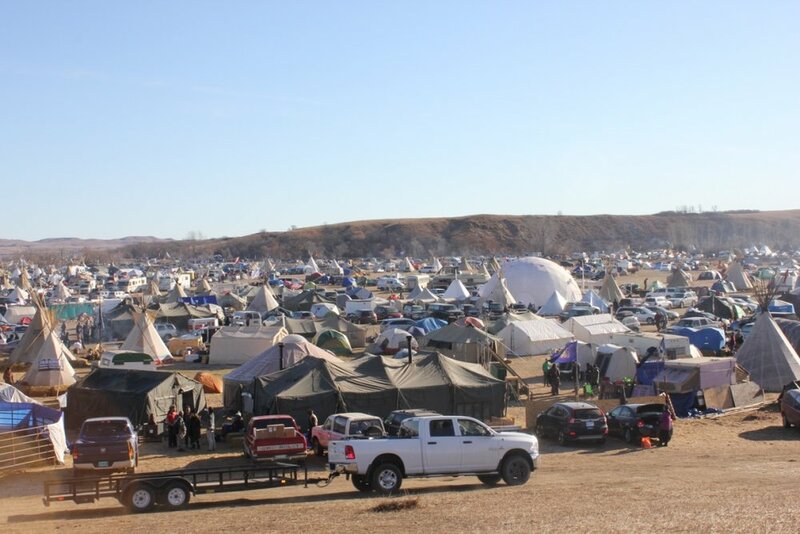 Teepees, canvas tents, RVs, yurts, corrals, moving vans, and adapted buses pepper the camp known as Oceti Sakowin. The white geodesic dome is a donation from Burning Man, and serves as a communal space for meals, orientation meetings, action meetings, and a nightly discussion of decolonization. It also provides sleeping space for campers unprepared for cold weather. A camper fills propane tanks for his comrades. Volunteers organize the many winter coats donated to Standing Rock in preparation for winter. Protesters drop off food donations outside a community mess mall as the camp stocks up for winter. Various repurposed buses serve as shelter and other facilities for campers. Protesters are building more permanent structures in the camp, using cardboard and plastic bottles as insulation against the immanent ND winter. A small solar panel peeks out on the left side of the picture. A camper puts honey in his tea on the edge of the camp’s medical facility. Cars line up at the north entrance of Oceti Sakwin camp on Black Friday. Abram Loeb, came from Binghamton, NY in his vegetable oil-powered truck to show support for the Standing Rock tribe. Security lights to the northeast of Oceti Sakowin face the camp from dusk till dawn, serving as an intimidation measure. A water protector waves an impressive homemade flag, which expresses native unity against the corrosive forces of colonialism. Navaho woman Debbie Veres stands with her children, Keeka, Kody, Kima and “Coolboy,” and her motorcycle buddy, Andrew Minimules, a decorated Vietnam veteran. Young Navaho men Brandon Beguy, Kenneth Shirley, Ty Lodgepole and Turtle Owens, of a dance group they call Indigenous Enterprise, prepare for a performance. Original story appeared in Last Best News. Also, a li'l radio interview fell out of this piece.